When a dog comes to us their first stop is to our of our veterinarians for a medical evaluation and treatment. Prior to adoption all our dogs are altered, fully vaccinated, microchipped, and treated for any/all necessary medical conditions. Since 97 per cent of all dogs that come in are heartworm positive we treat for that, otherwise they go on prevention. Many of the dogs come to us with other medical concerns that can take time, money and love to resolve. Heart came to us as a mature lady with so much love to give. I don't think she fully understood why she was at the shelter after all these years but once she hit her foster home... She knew. 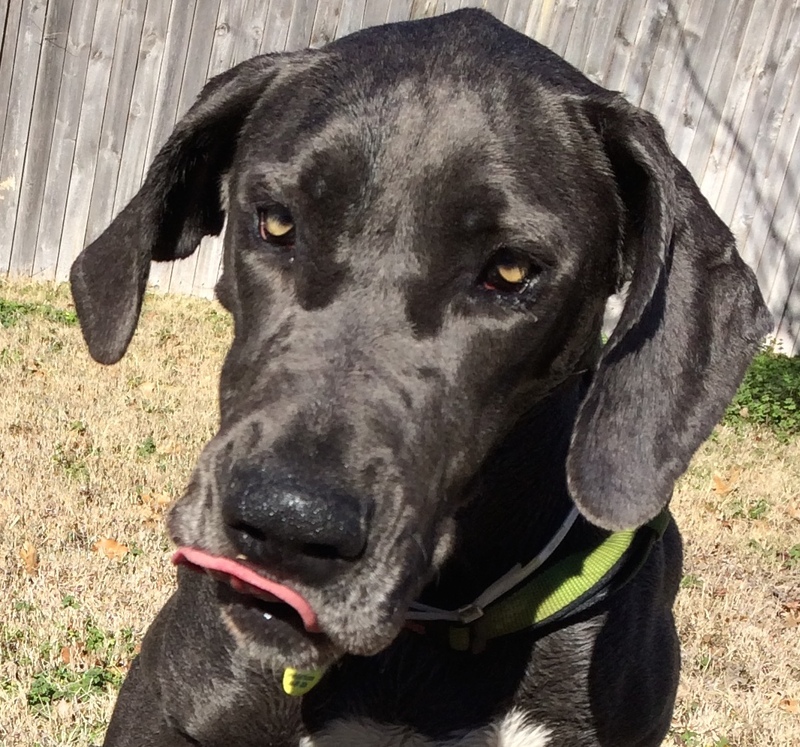 Sweet Onyx came to rescue heartworm positive and had to undergo treatment. Heartworm treatment is not only expensive but can be very hard on the dog. Heartworm treatment frequently makes them feel yucky and requires weeks sometimes months of crate rest. It is no fun for anyone. (Please consult with your veterinarian to assure your pet is protected..) Onyx was also very happy to take her "No Puppy Pledge" while with us. 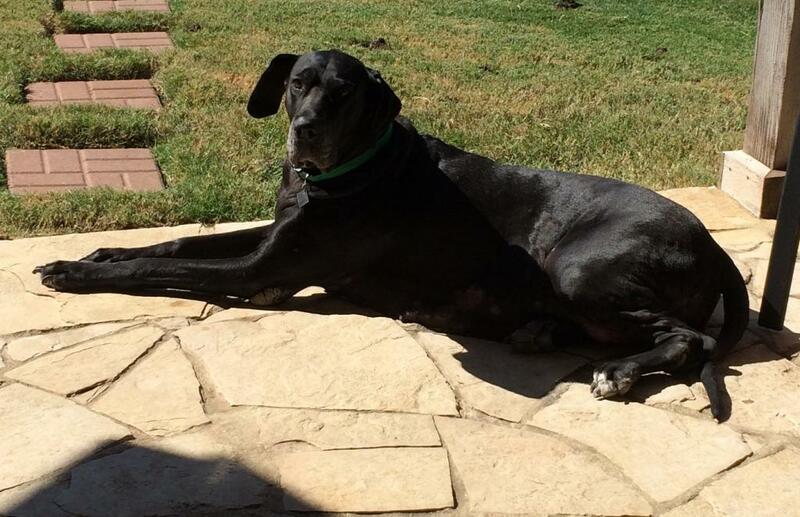 Read more about Onyx has found her GEM! 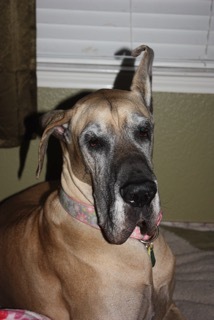 Some danes just don't know to "act their age"! I will tell people that in these days even beer comes date stamped, but dogs still don't. When dogs come in their age is estimated by our veterinarians and that is the age we use. Hailey's foster family said that she had the heart and energy of a younger dog, too many people just wouldn't meet her because of her age. Yet our policy is to stick with the veterinary estimate, generally people don't mind if the dog is younger... but older dogs do have a hard time being adopted. Even with her easy going attitude, playfullness and sweet spirit she was overlooked by adopters.. until now! 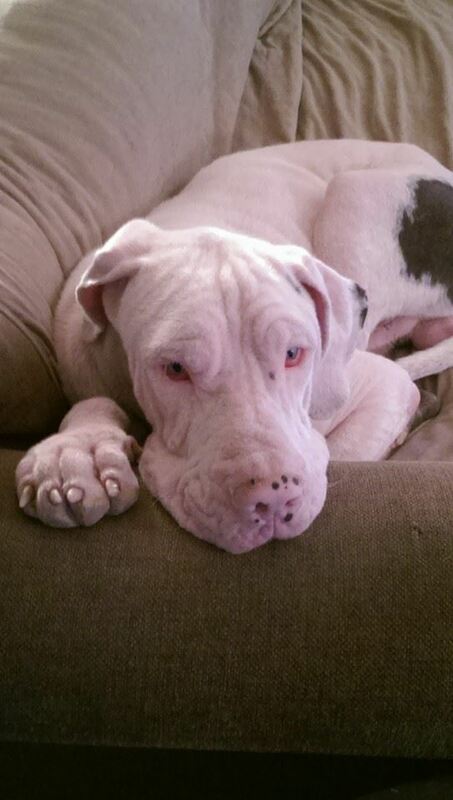 I think it is safe to say that it was worth the wait for Hailey to score this awesome furever home! 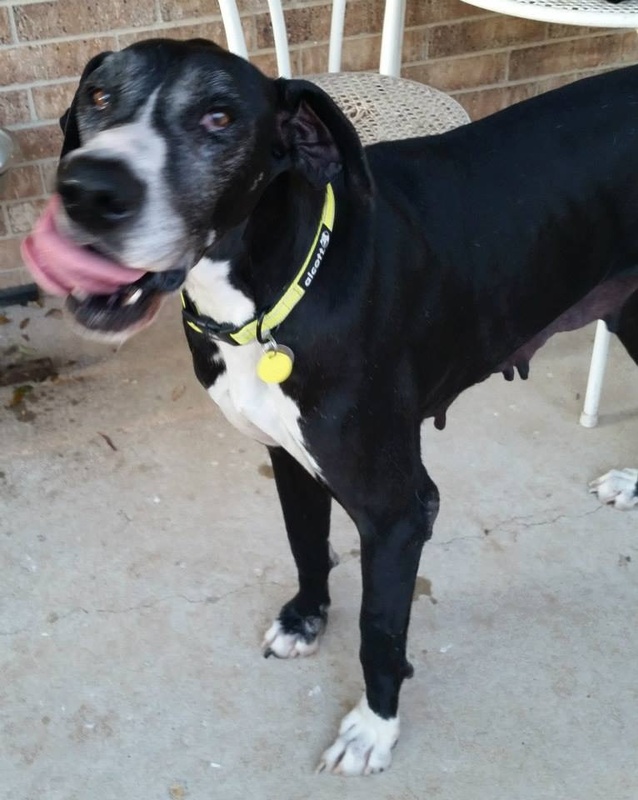 This couple saw only a lovely, FURever family member and knew instantly that Hailey was their furever dane. Day one and she already had a trove of new toys, bed and love! Congrats to Hailey and her family! Those of us of a certain age will remember the cartoon series the Jetsons. 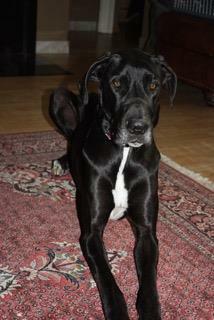 Part of the family was a big, lovable and sweet great dane.. so the name fit our Astro perfectly. He has hardly met a heartbeat he did not like, loves his people (specifically the younger ones) and is a true playful spirit. 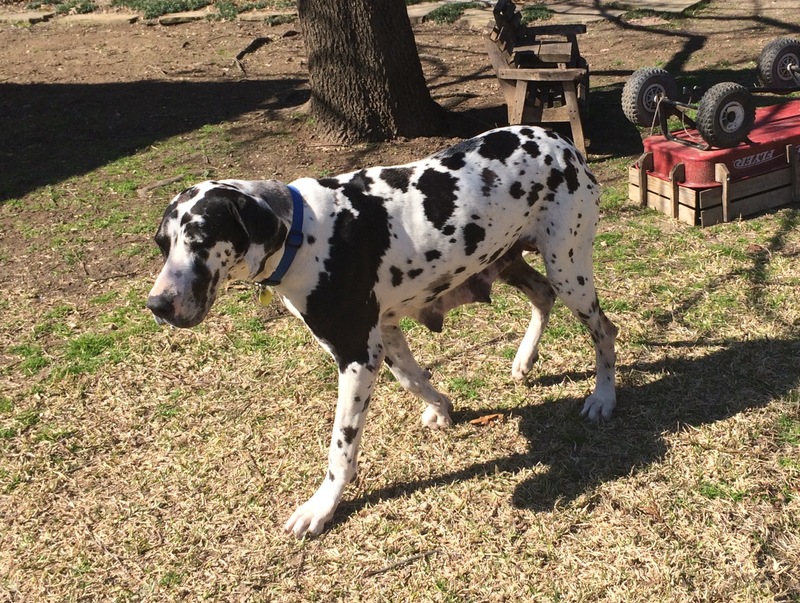 When a past adopter came to us looking to fill the big void left after the passing of their dane we knew he would be a great fit. All our dogs are special to us but some are just a little more "special" due to bad breeding, Albus's swim in the shallow end of the gene pool meant he was born considerably vision and hearing impaired. He sees very little and hears some... We have experienced foster homes who work with blind/deaf dogs using a combination of scent and touch signals to train these dogs and get them ready for their furever homes. They are also "special" because b/d dogs require "special" furever homes that have some experience, and are willing to open their home to a dog you have to teach beyond the basics... Sometimes these dogs stay with us a little longer so that the perfect FURever home can find us. I am so excited to say that home has found Albus and not only has continued his training but taking it another level. Albus is loving life with his new humom and dane brother. Turbo the Terrific found his forever home! He was adopted by a fantastic family that is dane savy. Turbo has a new older fur sister that is showing him the ropes of the house. He has learned to use the doggy door and is improving on his leash skills. The family kid are even able to walk him! Turbo is head over hills in love with his new Mom. She said he is her shadow and takes every opportunity to "dane lean" on her.